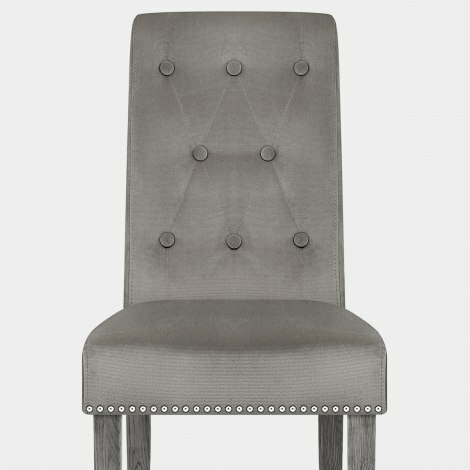 The stylish Moreton Dining Chair Grey Velvet is the perfect model to lend a touch of class to any room. An opulent statement with high levels of comfort and an uncompromised look, the Moreton exudes a modern sophistication that offers charm and character. Covered with gorgeous grey velvet upholstery, its neutral tone artfully enriches any colour scheme, from the colourful to the more subdued. A tall backrest, decorated with quilt and button detailing, provides support to the back, with a scroll-top and metallic stud-edge seat pad for a classical edge. Plus, a well-padded seat cushion ensures that you remain comfortable. The frame, formed of four tapered legs, is crafted from solid wood, with a grey wash finish complementing the seat colour. Protective floor plugs are also included to help keep your floors safe from scuffs. "I’m so happy with the quality, feel and design"
I am absolutely over the moon with my purchase, the quality, the look and affordability of these chairs is perfect. I also bought the Etienne grey velvet chairs for the table ends. They are also really comfortable to sit in! Very sturdy chairs, Look lovely! Just hope they can survive the grandchildren!! 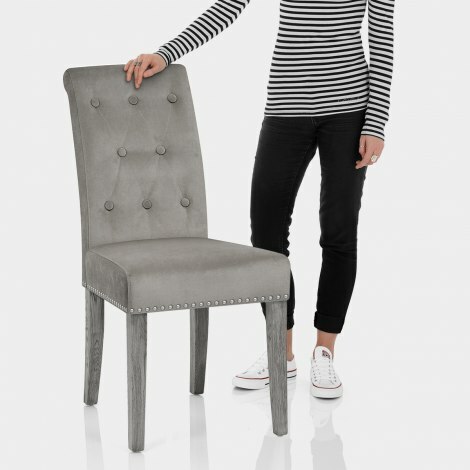 Bought 10 of these luxury grey velvet chairs after months of looking In countless shops, great quality also great price at a fraction of the cost at what I was looking at. Would highly recommend Atlantic and these chairs. Really happy with chairs. They look great and are a good quality. Would recommended. Spent months looking for the perfect chair, Perfect colours and very comfortable!